Welcome to our Open House page! 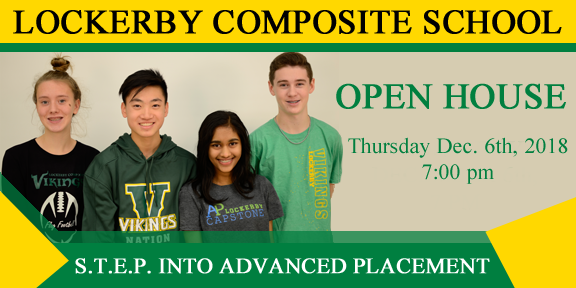 Please plan on attending our open house this year! You won’t be disappointed. STEP Program: Our Science and Technology Education Program continues to thrive, attracting the students who like to learn by experimenting, building, designing, and participating in other proven experiential learning models. Laptop Program: Often imitated, never duplicated. We have a true laptop program, not a Chromebook or “Bring Your Own Device” program. Students do amazing things with their laptops that lesser technology simply can’t achieve. Read more. AP Capstone: A premier advanced placement program aimed at giving our students a leg-up on the competition for university entrance. More AP courses on the way including Calculus and Computer Science – stay tuned! Read more. French Immersion: We have French Immersion classes in geography, French, history, phys.ed., health, and even technology. And no split classes! Read more. SHSMs: Specialist High Skills Majors are offered in Heath & Wellness and Mining Engineering. We have more in the works too! Forensics, Architecture, Interior Design, Enriched Math, S.T.E.A.M., and so much more. December 6th! Don’t miss it! Get a student's perspective of AP Capstone. Watch this video.